Korean Re has been committed to fulfilling its corporate social responsibilities in a way that creates value for society. In 2018, we continued to implement our regular employee volunteer programs designed to support underserved people and communities. 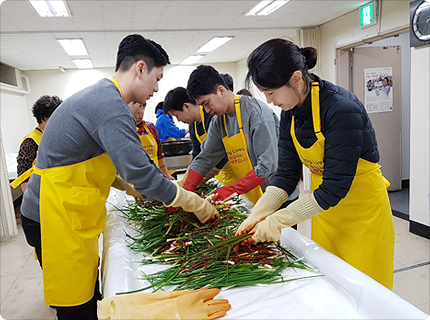 From October to November, we organized four rounds of community food-sharing events at a local Red Cross volunteer center where groups of Korean Re employees cooked food and baked bread. The food was packed and then delivered to those in need, including the elderly living alone and low-income families. A total of 50 families received the food package. Meanwhile, we increased our donation to the community we sponsor regularly. On December 12, CEO Jong-Gyu Won and a group of 20 Korean Re employees visited Iwhadong - an inner city town in the neighborhood of the Korean Re head office in Jongno District, Seoul and donated KRW 70 million worth of rice, food products and other necessities to financially difficult households in the community. Some of the packages were personally delivered door to door by the Korean Re volunteers. We also visited a child support center in the community and provided supplies to children from low-income families. This annual giving initiative has continued for the past 15 years since 2004 when Korean Re agreed to become a regular sponsor of the town. Through the donation program, we provide support to the less privileged in the community once every year. We will continue to organize corporate volunteering and giving programs as we firmly uphold the value of giving back to the community where we do business. We believe that our company can benefit from such programs as they help our employees improve their team-building skills, leading to increased morale and productivity.